Luck o’ The Irish Classic Slot Guide & Review - Casino Answers! 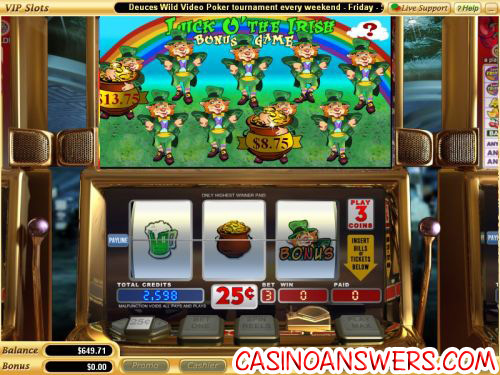 Luck o’ the Irish is a 3-reel, 1-line classic slot machine developed by Vegas Technology, featuring a wild symbol, multipliers and a bonus game. 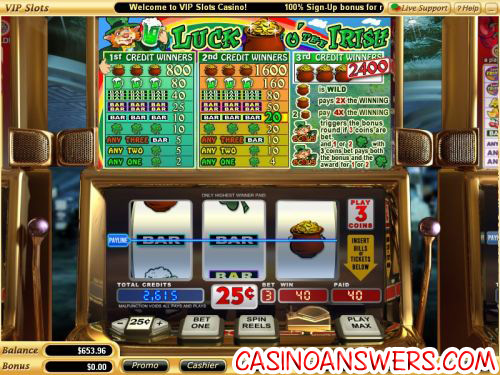 You can play the Luck o’ the Irish bonus slot machine at US-friendly online casinos Go Casino and Super Slots Casino. To play the Luck o’ the Irish slot machine, you must first set your coin value. The default is $0.25, but you can lower it to the minimum of $0.10 or you can raise the coin size to $0.50, $1, $5 or $10. Once you’ve set your coin size, you can use “Bet One” to bet 1, 2 or 3 coins or spin the reels using the “Bet Max” button to play the 3-coin maximum bet. Casino Answers recommends you play the 3-coin maximum bet to enable the bonus features on the Luck o’ the Irish slot machine. The lowest bet you can make on the Luck o’ the Irish slot is $0.10. The highest bet available is $30 per spin. The top jackpot on Luck o’ the Irish is the Pot of Gold symbol. On a maximum 3-coin bet, you can win 2400 coins if you are lucky enough to hit three Pot of Gold symbols on the payline. On three-coin bets only, the Pot of Gold symbol is also the wild symbol and it will substitute for all symbols in the game (including bonus symbols) to complete any winning combination. Not only that, but one Pot of Gold symbol will act as a 2X multiplier and two symbols act as a 4X multiplier. Again, this only applies for the maximum bet. Payouts on the Luck o’ the Irish classic slot machine are (1/2/3 coin payouts in parenthesis): 1 Leprechaun symbol (-/-/bonus), 1 Four Leaf Clover symbol (2/4/4), 2 Four Leaf Clover symbols (5/10/10), any 3 Bar symbols (5/10/10), 3 Four Leaf Clover symbols (10/20/20), 3 Single Bar symbols (10/20/20), 3 Double Bar symbols (25/50/50), 3 Triple Bar symbols (40/80/80), 3 Green Beer symbols (80/160/160), 3 Pots of Gold (800/1600/2400). In most cases the 3-coin payout is the same as the 2-coin payout. The added value in the 3-coin maximum bet is wild symbols and multipliers. To get up to $20,000 in bonus cash along with 4 free slot tournament entries where you can participate in Luck o’ the Irish slot tournaments among many more Vegas Tech casino games, sign up and make your deposit now at Go Casino! Are American players able to play the Luck o’ the Irish slot game? Yes, players based in the United States are able to sign up and play at Vegas Tech online casinos such as Go Casino and Super Slots Casino to play over 125 games including the Luck o’ the Irish classic slot. Are Mac users able to play the Luck o’ the Irish slot machine? Yes, online casino enthusiasts on Macintosh computers can use the Instant Play option at Go Casino to play the Luck o’ the Irish slot machine. You can find it under “3-Reel Bonus Slots.” Make sure you have the latest version of Adobe Flash Player installed if you have any problems. What bonus features are on the Luck o’ the Irish bonus slot? Luck o’ the Irish offers a wild symbol with multipliers and a bonus game feature, which is fairly impressive considering Luck o’ the Irish is not a video slot. Irish slot machine? Clover slot machine game? Luck of the Irish classic slot?